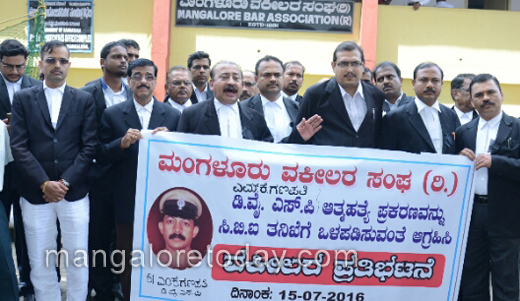 Mangaluru, July 15, 2016 : A protest was staged by the Mangalore Bar Association in front of the court premises on July 15, Friday demanding a CBI enquiry into the DySP M K Ganapathi suicide case. 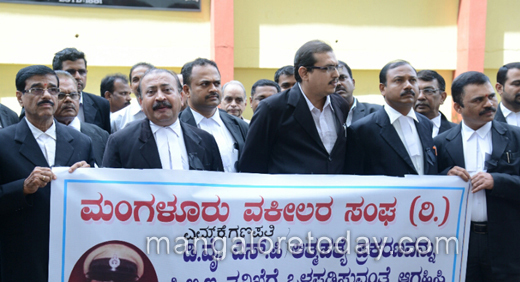 S P Chengappa, Mangalore Bar Association President and JD(S) leader said the Bar Association demands the immediate resignation of State Minister George whose name the officer had mentioned in the interview he gave to a TV channel a few hours before his suicide. He also demanded the suspension of the two senior IPS officials whom the DySP had named in his interview. 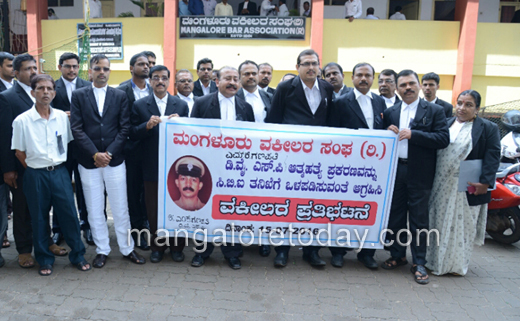 Chengappa also revealed that he had met DySP Ganapathi four days before he ended his life and that during their meeting the officer had spoke about the harassment meted out to him. The lawyers have resumed duty today wearing black badges as a mark of protest.